Roughly speaking the M to G ratio of the alginate largely controls functionality. Work has shown that a more sophisticated approach linking gel properties to block size produces a better correlation. Alginate was originally thought to consist of a uniform polymer of mannuronic acid as shown in figure 1. However later studies showed the presence of guluronic acid residues and it is now understood that alginate is a linear co-polymer of β-D-Mannuronic acid and α±-L-Guluronic acid. Alginate can be produced by a microbial fermentation using bacteria such as Azobacter Vinelandii and Pseudomonas Aeruginosa (Linker and Jones 1964, Gorin and Spencer 1966). These bacteria produce a polysaccharide with a structure resembling alginate, differing only in that there are acetyl groups on a portion of the C2 and C3 hydroxyls. 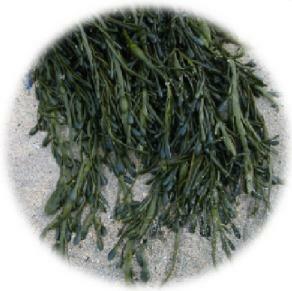 Alginate, as mentioned before, is found in all types of Phaeophycaea and apart from being a structural polysaccharide and providing rigidity to the algae it also helps prevent the dessication of those plants expose to air at low tide. 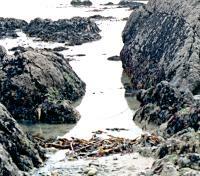 Alginate occurs in brown seaweeds in the intercellular mucilage and algal cell wall as an insoluble mixed salt. Alginic acid was discovered, first extracted and patented by Stanford in the 1880's (Stanford 1881 and 1885). 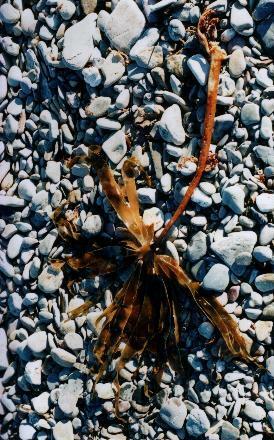 the patent explains how alginate can be extracted by soaking seaweed in water or dilute acid, extracting with sodium carbonate and then precipitating the alginate out of solution with acid. The usual method for the determination of the ratio of the two uronic acid types is by hydrolysis of the chain followed by analysis of the sugar components. The presence of three different types of polymer segment has been shown by mild acid hydrolysis (Haug et al 1966, 1967a, 1967b). one type of segment consists entirely of guluronic acid residues, one consists entirely of mannuronic acid residues and the third consists of an alternating sequence of mannuronic and guluronic acid residues. Further fine structure information has been obtained from the action of certain alginate lyases upon the alginate chain. An extracellular poly α-L-guluronate lyase was used to degrade the α-L-guluronic acid and random segments and subsequently measure the chain length of the poly β-D-mannuronic acid blocks. The polyguluronic acid segments are very different to the polymannuronic acid segments. The guluronic acid residues are in the 1C4 conformation and are therefore diaxially linked along the polymer chain. This gives the ribbon structure of the polymer a buckled, as opposed to flat, conformation. The tertiary structure of alginate has been comprehensively reviewed (Morris, 1986). Alginate adopts an extended, ribbon like conformation, in the solid state, being a two fold structure for the free acid form (Atkins, 1973) and a three fold structure in the salt forms so far studied (Mackie, 1973).